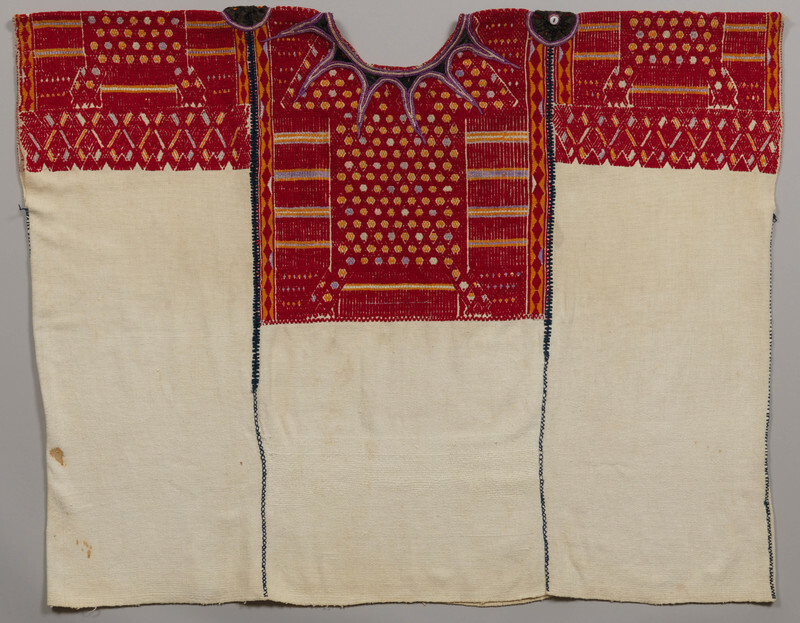 "Creations of the Red Goddess: The Women’s Blouse (Pot, Huipíl) from Chichicastenango over Time," by Rebecca R. Stone, Ph.D. Figure 1. This example represents the epitome of Chichicastenango women’s blouses, featuring cloth made of the naturally light brown shades of cotton. Michael C. Carlos Museum, 2009.42.47. Photo by Bruce M. White, 2011. For millennia (as discussed in The Ties that Bind) Maya women have worn the pot, K’iche’ Mayan for the woman’s rectangular blouse perhaps better known by the Spanish term huipil (figs. 1, 14-15, 17-21). In the town of Chichicastenango, Guatemala, they are worn, sold, honored, and preserved as the heights of Maya fiber artistry. This famous town mixes indigenous people (many of which only speak K’iche’ Mayan), other Maya vendors, Hispanicized Latin Americans known as ladinos, ex-patriot Europeans and Americans, and visiting tourists on a daily basis, and especially on market days. Thus, Chichicastenango exemplifies the theme of this project, that is persistent tradition embracing pervasive change in various cultures and times in the Native Americas. At over 4,000 feet of altitude and some eighty-five miles northwest of modern Guatemala City lies the bustling Maya-dominated town of Santo Tomás Chichicastenango (fig. 2). Its very name tells a complex political story. After conquest, the colonizing Spanish usually added names of saints to local town names so as to appropriate and insinuate themselves into indigenous geography, a perfect case of syncretism. In this case, the name conflated not only Catholic overlay but Central Mexican native input, the Tlaxcalans who had become allies of the Spanish (and helped them defeat the Aztec Empire as well). Santo Tomás became the prefix to what the Tlaxcalans called Tzitzicaztenanco, or “City of Nettles”, based on its original Maya name of Chaviar or Chuwila, meaning “Over the Nettles” (Rodas, Rodas, and Hawkins 1940, 6). In yet another nod to Spanish dominance, a modern local name for residents is Maxeños, based on tomaseños, “those of Tomás” in Spanish (ibid., 7). The changes over time in a town’s name often chronicle historical layers of imperialism over indigenous culture. Figure 2. A modern view of the Chichicastenango market shows the colors and crowds. Photograph by chensiyuan, licensed under GFDL. Chichicastenango is part of the K’iche’ Maya region (fig. 3; previously and popularly called Quiché, using Spanish spelling). K’iche’ language speakers number over 1,600,000 people or 11% of the population of the country today (Instituto Nacional De Estadística 2012, 11). As such, they constitute the largest within the twenty-one recognized Mayan language groups (Spence et al. 1998). Note that the adjective “Mayan” is technically only used for the languages, not the people. 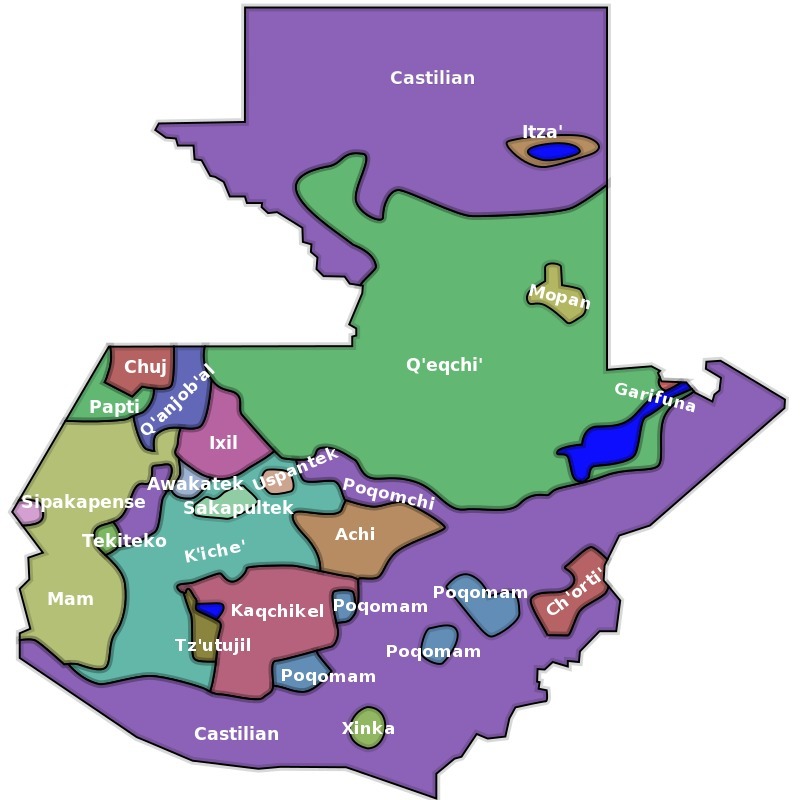 Estimates are that 92% of Chichicastenango residents still speak K’iche’ and about 20% monolingually (Campbell 1997). This persistent refusal to speak Spanish after over five hundred years of colonization shows how traditional a place it remains. Indeed, like the Guna of Panamá (see Engaging the New), the K’iche’ are notoriously resistant to outside influence, despite the fact that they participate in global practices such as fair trade, tourism, and Catholicism, at least superficially. In 1700 Friar Ximénez lamented “that the natives of Chichicastenango taught the traditional beliefs to their children ‘like the milk with which they are nursed’” (Carmack 1981, 6). Figure 3. This map delineates the many indigenous Mayan languages still spoken in Guatemala, with K’iche’ speakers (in turquoise) being the most numerous. Image by Chabacano, licensed under CC BY-SA 3.0. Certainly, the K’iche’ people have an illustrious past to maintain in defiance of outsiders. They are the descendants of those who wrote the famous Popol Vuh, or Council Book (fig. 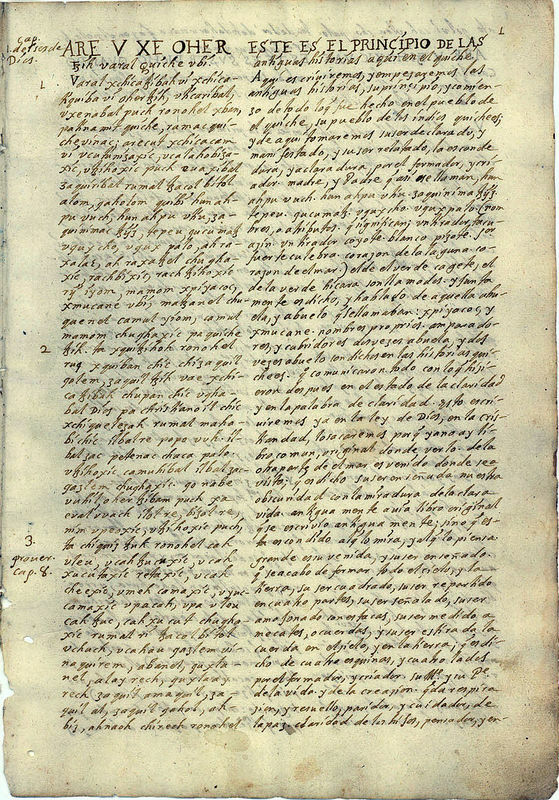 4), a copy of which was made in Chichicastenango and found by Spanish friar Francisco Ximénez (Christenson 2007, 22). Its fascinating blend of myth and history tells of Creation events and the K’iche’ claim of migrating from the Gulf Coast in the distant past (Tedlock 1996, 472). They took over this fertile area of the highlands, fighting with the people now to the south, the Kakchikel Maya, in a war that lasted from 1512 to 1519 (Rodas et al. 1940, 38-39). Along with the Tlaxcalans, the Kakchikel Maya sided with the Spanish Pedro de Alvarado, who was sent by Cortes in 1524 to subdue eastern Mesoamerica. The alliance of Spanish, Central Mexican, and enemy Maya managed to destroy the K’iche’ capital. On April 11, 1524 Alvarado reported to Cortés, “As I saw them [the K’iche’] to have such a bad will to the service of His Majesty and for the good and quiet of this land I burned them [two Maya leaders who had tried to set a trap for Alvarado]: and I commanded to burn the city and raze it to the foundations because it is so dangerous and so strong that it more appears a house of robbers than of citizens” (Rodas et al. 1940, 47). Many of the K’iche’ survivors fled to what was to become Chichicastenango. Figure 4. The famous K’iche’ book, the Popol Vuh, or Council Book is one of a handful of surviving ancient Maya books. From the collections of the Newberry Library, Chicago, Public Domain. What ensued is a history of barely concealed rebellion against the Spanish as political and religious overlords. To this day “they retain their pride of race, together with their cherished hatred of the white conquerors, their language, their sacred calendar, and their old numerical system [from ancient times]” (Rodas et al. 1940, 55). The ongoing dances in which the Spanish are mocked (fig. 5) are a testament to the fact that the animosity persists in public as well as private spheres. As for the traitorous Kakchikel allies, even in the early 20th century “The Kiche have not forgotten this act of the Kakchikel; in Chichicastenango during Holy Week a Judas dressed in Sololá costume is hanged” (Rodas et al. 1940, 39). Sololá is a Kakchikel Maya town, needless to say. Today Judas wears a Western shirt and a tie, plus a bright white mask and blue eyes, seemingly targeting all Anglos (fig. 6). Signs in Spanish and in English above him invite tourist Anglos and others to participate in the ritual hanging of the Judas figure, multiplying the layers of subversive meaning. There is much to lament about the treatment by outsiders and then countrymen of the Maya in colonial and modern times. Slavery of Maya officially ended in 1824, but in 1940 Indian slaves were still being “given” to ladino alcaldes or mayors. Thus, the Maya have occupied the lowest rung of Guatemalan society, below “mestizos” (Hispanicized “mixed race” sub-culture or caste) (Rodas et al. 1940, 49). Furthermore, many see Guatemala’s horrendous late 20th century civil war, which lasted thirty-six years, as a de facto genocidal attack on the Maya despite communist-capitalist agendas (e.g. Hitchcock and Koperski 2010, 589). For Maya traditions to have survived that persecution shows the strength of their beliefs, families, and wills. During the decades from 1960 to 1996 to wear indigenous dress was to effectively place a target on one’s back. Many chose to not wear their traje (Spanish for dress, implying native style) in order to survive. Dress is always key to identity; putting on white shirts, polyester pants, dresses was a way to appear “mestizo” and thereby avoid persecution. Figure 5. The Baile de los Toritos, Dance of the Little Bulls, mocks the Spanish to this day; like horses and sheep, cows were introduced to the Americas by the Europeans. Photograph by Pitxiquin, licensed under CC BY-SA 4.0. A sadly typical story is told by an older Maya weaver at the Corazón de Mujer (“Heart of Woman”), a weavers’ cooperative in Chimaltenango (see Contemporary Times below). During a raid she, her husband, young children, and a tiny baby ran into the woods but she and the baby became separated from the rest of the family. She met up with another group, but the baby’s crying was a danger to them all and they asked her to either kill the baby or leave the group. She bravely chose to strike out on her own. Wearing her distinctive pot, a neighbor from her town spotted her when she came to a road, and told her that her husband was not far down the road with the other children. In a sense, her blouse helped save her family (Occasionalmoment 2014). 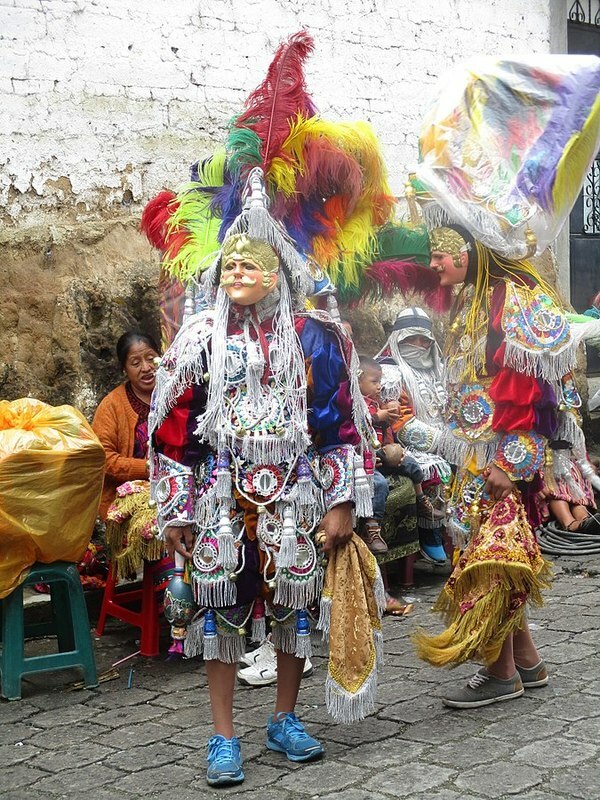 “Aside from fiestas, market days are the chief pleasures of stay-at-home maxeños. A market is…a place for meeting friends, talking to strangers, and watching the passing show…For the foreign visitor the Sunday marker is a thrilling experience. The two white churches with their wide dramatic steps sprinkled with…humanity in colorful costumes, with billows of smoke from burning pom [copal incense] dimming the scene, and in the market square, hundreds of Indians buying and selling, almost all wearing one or more garments of red—this seems to a wandering American a fantastic stage for a romantic opera” (Rodas et al. 1940, 90-91). Figure 6. 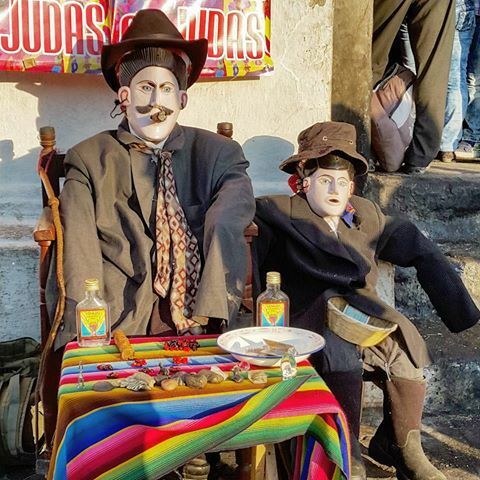 Today during Holy Week in Chichicastenango, Judas is shown as an Anglo with a white mask, mustache, and a suit and tie. In the past he was dressed as a Maya from Sololá, a nearby enemy Kakchikel town, since the Kakchikel sided with the Spanish to betray and defeat the K’iche’. Photograph courtesy of GuaTesoros. Today the same kinds of impressions remain: the brilliant colors, pungent smells, hawkers calling out to buyers, and the sun beating down on the crowds. Yet now tourists scan booths selling plastic sandals alongside those with gorgeous handwoven textiles from all over Guatemala, representing the many different Maya groups. Well-off and discerning buyers still try to buy a merchant’s spectacular blouse off her back and sometimes succeed. Market days in Chichicastenango are a multi-sensory and multi-cultural experience, rife with pickpockets, foreigners and locals jostling each other, easy to get lost among the brilliant colors and raucous sounds, tiring but exciting. A combination of modernity and timelessness pervades the scene. 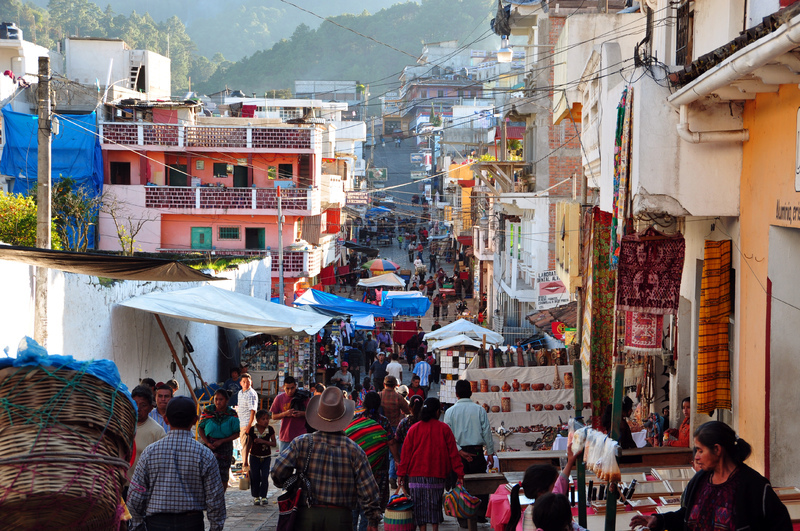 The Chichicastenango market surrounds and merges with the bright white Cathedral of Santo Tomás. Flowers are sold on its steps, incense burned, and members of the cofradías (religious confraternities, see Dressing the Saints) parade the santo/a figures through the throngs and ask for money to support their syncretic Catholic-shamanic rituals. This mixture of religions takes place, quite literally, out in the open, in the market, and even in the church itself (see Dressing the Saints). In 2016, a seller of wooden objects was surprised when I noticed, and subsequently bought, a carved tray with five depressions in the shape of a quincunx. The four corners, as the cardinal directions, with the center, form an age-old cosmogram. She told me in Spanish, “You can use it in the kitchen to hold eggs,” and I answered, “But is it not for divination?” She looked at me with surprise and nodded, then proceeded to give me a particularly good price. The exuberant dress of a traditional Maya woman often includes a voluminous wrap-around skirt, wide rectangular blouse and belt (fig. 10), plus a long wound head band, and various carrying cloths and shawls. By Western standards, none of the various items necessarily “match” either in color or patterning. Yet the exact colors and patterns of a given woman’s blouse and skirt indicate her allegiance to her Maya ethnicity in general, a particular Maya group and/or town, and the degree of tradition or change she has embraced. 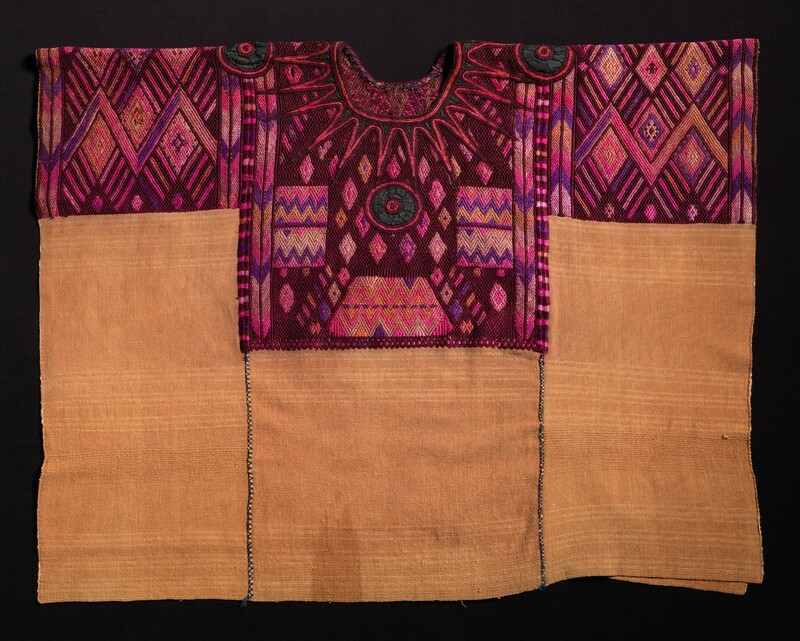 Like the indigenous Bolivian garments (see Capturing the Rainbow), this complex system of cloth serves as a map of specific as well as overall identity. Interestingly, as discussed in The Ties that Bind, so far scholars of the ancient Maya have not been able to identify quite such a regional dress delineation in the images of clothing found on ceramics and in sculpture. Possibly, the Spanish invaders and colonizers pushed the Maya into a more rigid system of identification. Figure 7. 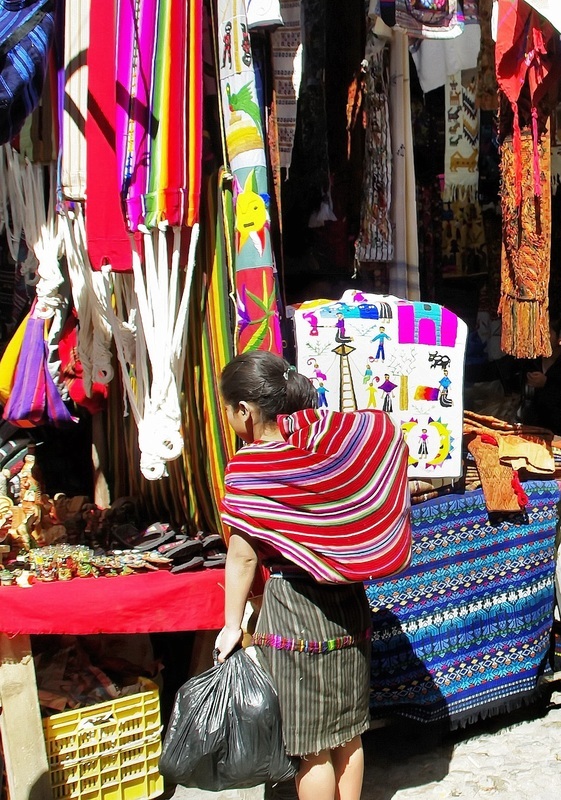 In the famous market of Chichicastenango, Maya women and men shop from each other, using both a traditional carrying cloth and a modern plastic bag to hold their purchases. Photograph courtesy of Max Pixel, licensed under CC0 1.0. Among the many styles worn and for sale in the market, the radiating embroidery around the neck of the pot (figs. 1, 10, 14-17, 19) is a major distinguishing factor of Chichicastenango high-status blouses. 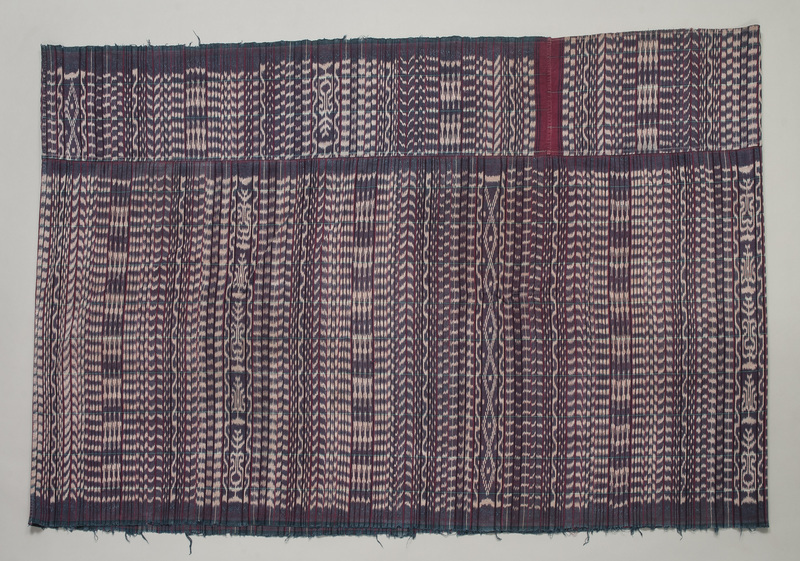 Also characteristic are the favored red-maroon-purple palette, upper areas of dense brocade completely obscuring the ground cloth, as well as shorter and wider proportions than most other Maya styles. Today large flowers dominate the brocade patterning (fig. 10), although this has not always been the case (figs. 1, 14-15, 17). Figure 8. The center third of older, better-made ceremonial Chichicastenango-style pots, complete with a “patch” filling in the neck hole, are being sold for table runners. Their distinctive radiating embroidery around the neck hole sets them off from other styles. Courtesy of Grace W. Stone. Photo by Michael McKelvey, 2017. By contrast, less-acculturated Chichicastenango women wear wrap-around skirts, lengths of treadle-loom-made cloth about a yard wide and five yards long (fig. 11). Often the width is sewn into a loop which the wearer steps into and then wraps around her body. The Spanish term corte stands for the wraparound skirt, but not the pleated one. It means “cut” and, while this would appear to be a familiar, straightforward description of a length of cloth being woven and then a length of it cut off and used, it is a profoundly European idea to do so. 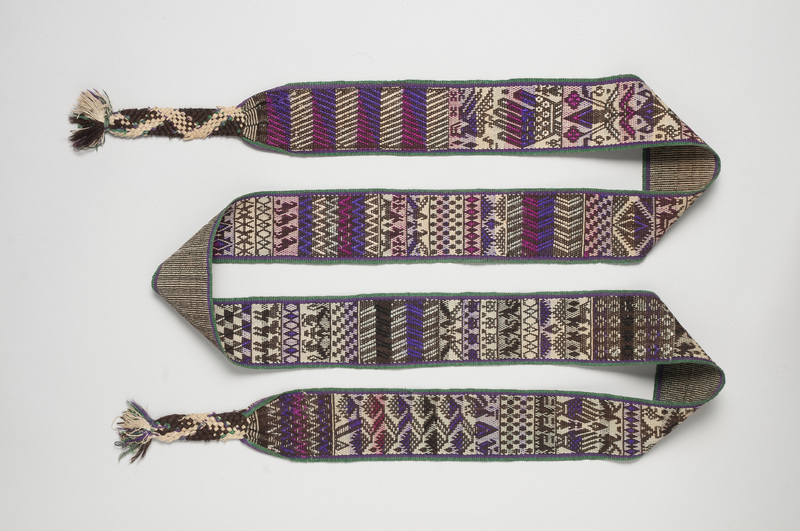 Weaving four-selvage items (meaning finished on all sides) and assembling rectangular-based garments holds for almost every ancient and traditional modern Andean example as it does for the pot and other items of conservative Maya women’s dress. Pre-Hispanic indigenous Americans almost never cut cloth (see The Best of the Best). This practice of cutting cloth was only reluctantly adopted in post-Hispanic culture, mostly by men who were forced into workshop settings to make cloth from sheep’s wool and with it tailor fitted Spanish-style garments for the colonists, then the ladinos (figs. 12a,b). Some ethnically Maya men still wear the garb seen here; however, they may well also sport t-shirts and slacks like the rest of the world. Figure 9. 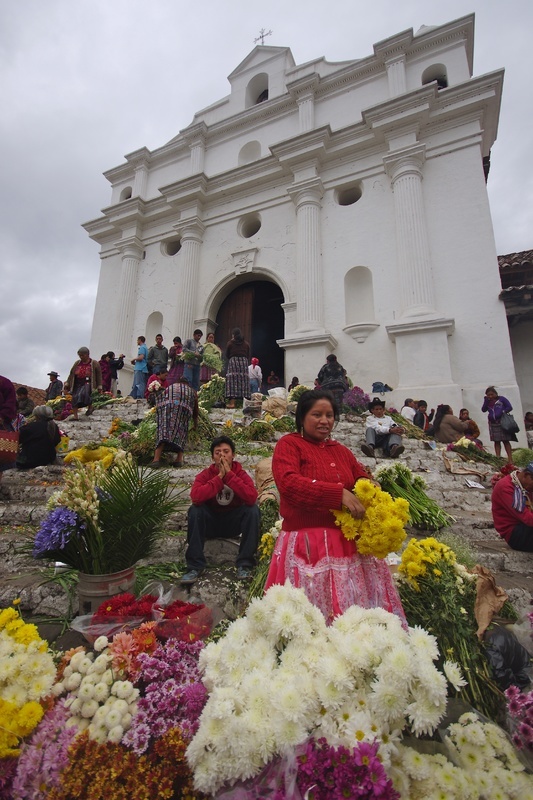 The Church of Santo Tomás in Chichicastenango always has flower sellers on its steps. Photograph by Adam Baker, licensed under CC BY 2.0. Women also now allow their skirts to be made from cut cloth; yet by sewing the corte into a tube, the messy cut edges are tamed and its cut nature is downplayed. Perhaps this is in deference to ancient beliefs that cloth is alive and to cut it damages its life force. Emphatic bands of embroidery cross most cortes vertically and horizontally (fig. 10), making a world-directions cross, a traditional cosmogram. Given the already culturally distinct choice to wear a corte, there are two ways to hold it up, both revealing. The most traditional woman eschews a belt, employing a clever twist at the top, whereas the intermediate cultural choice involves a belt. Belts are called pas in K’iche’ or faja in Spanish. Pas means “thin, compact, and strong.” They combine cotton and wool, therefore are men’s work in traditional belief (men work with the Spanish-introduced sheep and their clothes are made from the wool [figs. 12a,b]). Chichicastenango women adopt the belt over the wrap skirt and nowadays tuck the pot in under both garments. However, in the early 20th century they did not, usually leaving the hem of the pot showing (Rodas et al. 1940, 125). Tucking blouses in is arguably more Spanish and leaving them out more Maya, as seen in an ancient depictions (see The Ties that Bind). Figure 10. 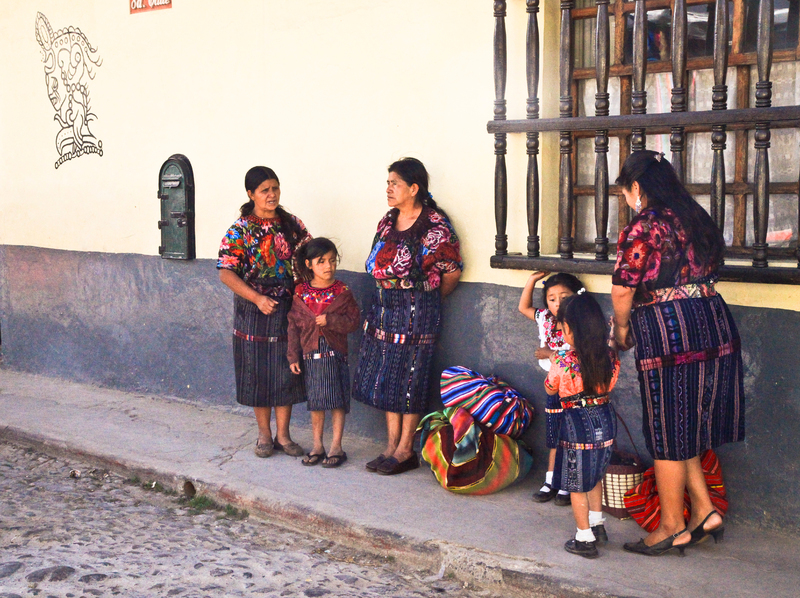 Typical Chichicastenango women and girls wear the traditional dress of today, which may include a polyester sweater and imported shoes along with a typical corte (skirt), huipíl (blouse), and belt. Photograph by Erik Törner, licensed under CC BY-NC-SA 2.0. “The maxeña will own two or more pot, one embroidered [sic, brocaded] more elaborately for dress. She will wash them carefully and wear them for years and years.The women become very fond of their pot and often a woman will prefer to wear an old, ragged one rather than discard it for a new one. And it is said that in some parts of Guatemala at least, women may wear their blouses wrong side out to market to avoid tourists’ trying to buy them. In Chichicastenango it is a curious old custom…for the maxeña to wear the pot inside out on Saturdays, in the home” (ibid., 124). In a ceremonial pot, the center panel sports a longer portion of brocade down the woman’s front and back, while the side panels have shorter units of it over her shoulders and upper arms. Seen opened out, that is before the side seams are sewn up, the brocade forms a cross (not a Christian asymmetrical one, but a four-directional indigenous one, as seen also in the skirt embroidery). “In the pot the cross [of brocade] also represents the earth, or land, and it is bordered by wavelike designs in red and orange representing the waves of the sea breaking upon the shore: showing [that] the woman is productive like the earth” (ibid., 119). Furthermore, her patterns show she is productive like the earth when it is blessed by water and therefore able to yield corn and the other necessary plants. Figure 11. 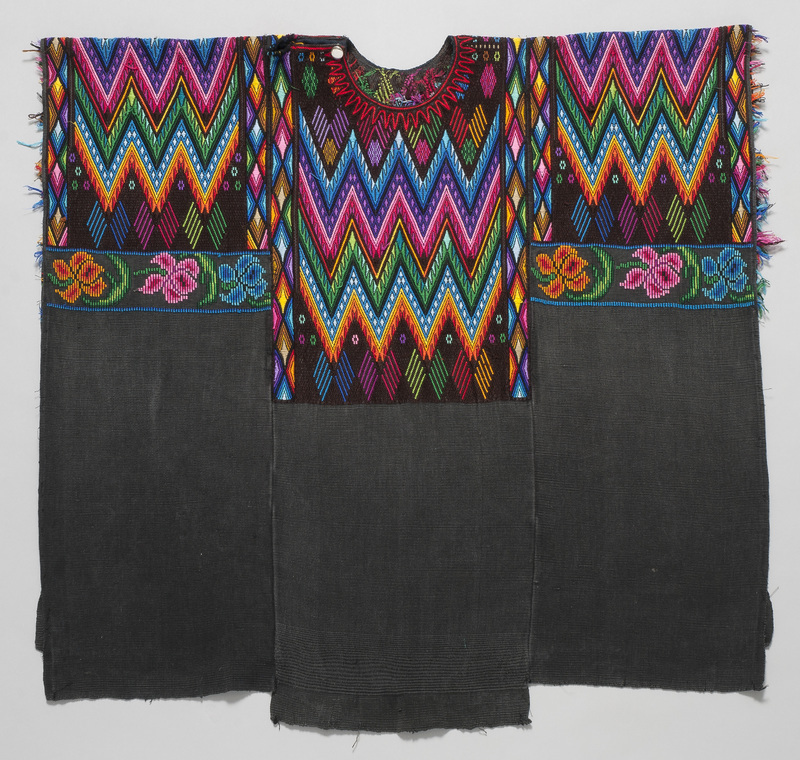 Maya blouses are worn over skirts, this corte (Spanish for “cut”) is machine woven, cut, and sewn into a wide loop; the wearer steps into the center and wraps it around her waist, usually securing it with a belt. This example is from the town of Totonicapán. Michael C. Carlos Museum, 2009.42.328. Photo by Michael McKelvey, 2017. Within the shoulder-area crossbars and inside the wave bands, zigzags with perpendicular lines coming off each diagonal are often found on a Chichicastenango pot. These patterns were seen as the mountains covered with trees; these “’heads of the mountains’” are…the most sacred places, nearest the gods and the ancestors.” (ibid., 123). Thus, the sacred landscape — earth, water, mountains, trees — is abstractly encoded in the seemingly geometric or “decorative” designs of the Chichicastenango huipíl. Perhaps the most diagnostic feature is the radiating neck embroidery, which is said to represent the sun, as its pointed rays strongly suggest. A woman, preferably with a number of children, wears this badge of adulthood and spiritual connection to the celestial. Yet her husband actually embroidered the suns on her pot because it is “a symbol of virility and divinity” (ibid., 122). Therefore, a woman who is married and bears the stamp of this masculine finishing pattern indicates that she has a man to procreate with and also to card fiber, spin thread, and embroider, as well as potentially run the treadle or foot loom and make her cortes for her. Weaving is a family affair. Figure 12a. Chichicastenango men’s jackets and pants show Spanish-style cutting and tailoring of cloth, a wholly new idea beginning in the 1500s. Michael C. Carlos Museum, 2009.42.93 (jacket). Photo by Michael McKelvey, 2017. Figure 12b. Chichicastenango men’s jackets and pants show Spanish-style cutting and tailoring of cloth, a wholly new idea beginning in the 1500s. Michael C. Carlos Museum, 2009.42.96 (pants). Photo by Michael McKelvey, 2017. She weaves and brocades her pot, showing the complementary work of a successful couple (much like the Andean concept of ayni explored in Dialogues in Thread). The ideal family unit is aptly expressed in elaborate cloth to the textile-literate Maya. Since thread creation comes first and embroidery last, the man’s efforts sandwich the woman’s in a symmetrical collaborative process. It would follow that an unmarried or childless outsider woman wanting to own or wear one of these symbolically dense compositions would break the Maya sacred rules. While the intensity of belief has lessened over time, and tourist products are often not invested with the full effort and symbolism, the assumptions of the various parties in a marketplace exchange remain at odds in many ways. More meaning is found in another superstructural addition. Often, especially in the early-to-mid 20th century, up to four small round pieces of black silk were appliquéd onto the brocade sections, two on the shoulders and two on the center front and back. Appliqué means the cloth circles had their edges turned under and were sewn down on top of the preexisting brocaded cloth. Early on, these circles would have had a silver button or a coin sewn in their centers (ibid., 121). These metal additions are almost all missing from the older examples and this practice has become rare of late. One Carlos Chichicastenango huipil (fig. 14) has white buttons sewn in this position; they are still a “foreign” prestige object, but reflect change from the use of metal in this position. The black circles with silver/white centers were considered to represent the moon (possibly its four major phases), plus they also form another set of the four directions. Besides the silver or white echoing the light of the moon itself, coins and metal in general naturally would be status symbols, indicative of wealth in Spanish terms. For a Maya woman, her wealth is demonstrated by the fineness of her best huipíl, and comes from being a good merchant as well as weaver, or seller of weavings themselves. If she were successful enough to be able to display money rather than spend it, she was successful indeed. Perhaps the wearer of the button blouse was slightly poorer than others (in fact the quality of the brocade in this example is slightly lower as well). Figure 13. A very elaborate belt (faja in Spanish) is worn for a wedding ensemble in the town of Totonicapán. Michael C. Carlos Museum, 2009.42.421. Photo by Michael McKelvey, 2017. Fertile adult women thus wore the sun and the moon, the complementary celestial forces. The K’iche’ word for “woman,” ixoc, means “the world of the moon” and to wear them is to announce she is in her reproductive prime when the moon rules her cycles. Pre-adolescent girls in the early- to mid-20th century were not entitled to wear the sun-moon, nor was a woman who was childless for any reason. (ibid., 122-123) This symbolism has seemingly broken down in the last few decades, or at least the strict application of it. It is also always possible that what is presented in market for sale to tourists lacks the most important imagery to keep some of the indigenous culture from being appropriated. Thus, special garments function not simply to distinguish her as someone from Chichicastenango, but also to show her skills as a weaver and merchant, and her attainment of the ideal state of motherhood through a cooperative union with a good man. They also cover her in earth, moon, sun, water, mountains, and the four directions; in other words, her dress makes her into a sacred landscape. 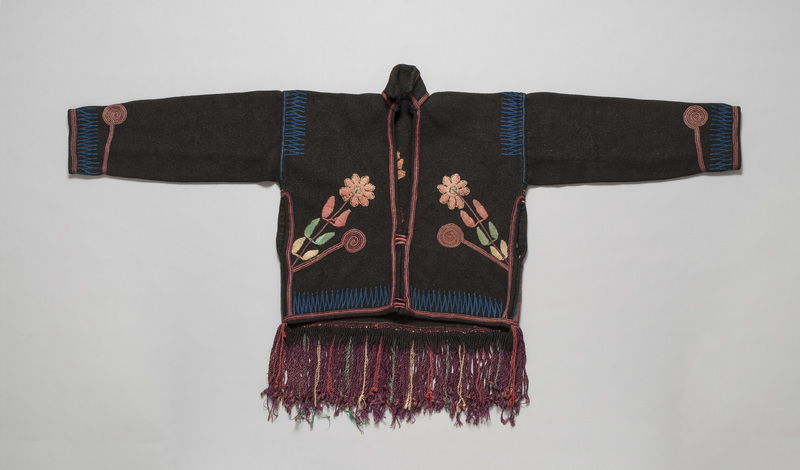 Therefore it is no wonder that artists have been conservative in introducing changes over the last century or so, though like the other modern indigenous textiles in this exhibition, some changes have also been embraced within the Chichicastenango pot. Figure 14. This blouse from ca. 1910 has two black appliqué circles with white buttons sewn to their centers to represent the moon. Michael C. Carlos Museum, 2009.42.28. Photo by Bruce M. White, 2014. Creamy white backgrounds dominated the early 20th-century style of the Chichicastenango ceremonial pot. As in all cultures, white is notoriously hard to keep clean and so is often reserved for special clothing in general and particularly for elites to wear (because they do not engage in manual labor). The previous comment about wearing the blouse inside out on Saturdays comes to mind. 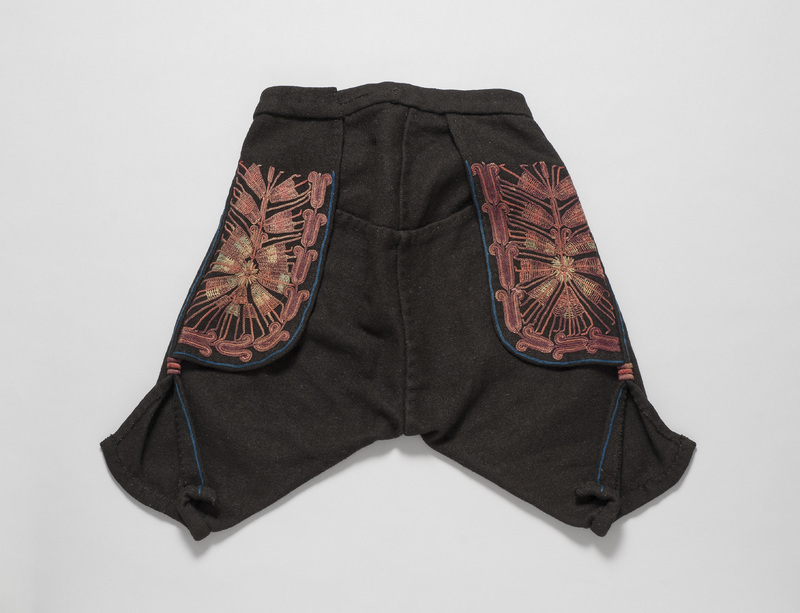 The seams joining the three panels are accentuated by colorful embroidery, drawing further attention to the fact that it is a high-status garment, not an everyday one. The neckline sun embroidery is also prominent in contrasting light purple on the red brocade in figure 14. Speaking of this period, Rodas et al comment repeatedly on the predominance of red in Chichicastenango dress. Figure 15. 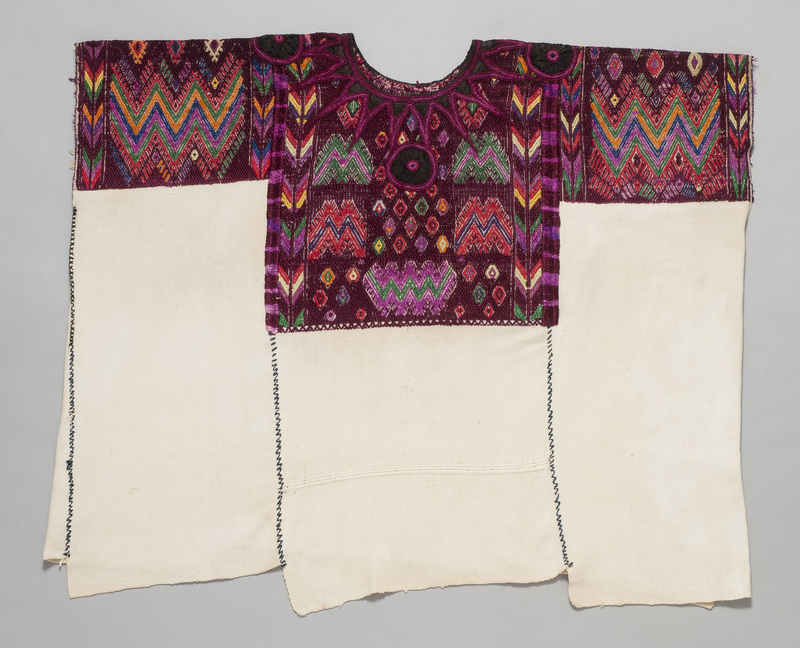 This spectacular 1920’s Chichicastenango woman’s blouse features the two colors of naturally (undyed) brown cotton. See figure 1 for the complete pot. Michael C. Carlos Museum, 2009.42.47. Photo by Bruce M. White, 2011. The masterwork seen in figures 1 and 16 epitomizes the height of Chichicastenango weaving during the 1920s and 30s. It combines the preferred zigzags and diamonds with the new love of purple and the age-old value placed on naturally colored cotton. The two shades of light brown and beige seen in this pot are not dyed to these colors; they existed in these colors on the plants (Mejía de Rodas 2002). Cuyuscate is the common name for the light chestnut brown (fig. 16a), though similar words such as coyuche are also used (Murphy 2016). When washed or boiled, cuyuscate turns a darker, richer color (fig. 16b). The term ixcaco stands usually for the beige. A slightly mauve one also exists, as does a yellow-green (fig. 16c), which dramatically intensifies when washed or boiled (fig. 16d). 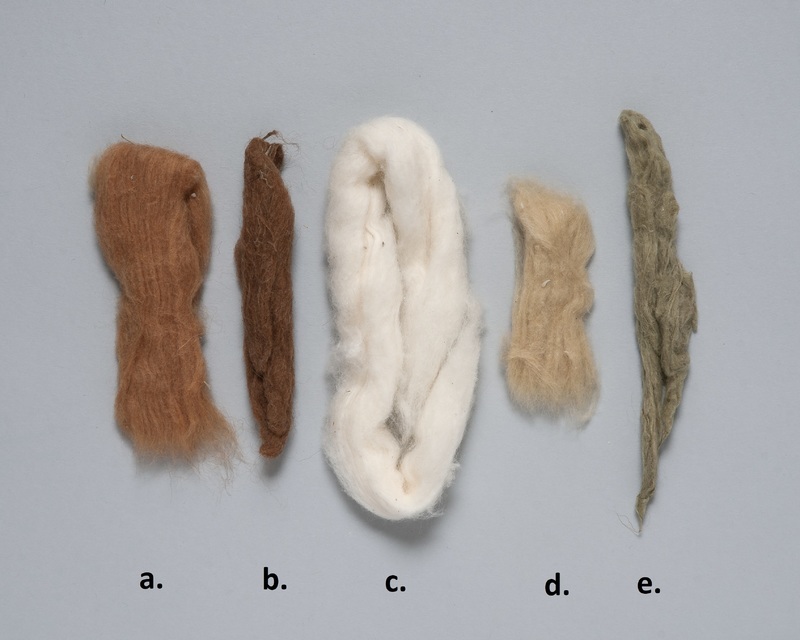 These unusual cottons were prominent in ancient Andean fiberworks as well, showing that the colors that the earth yielded naturally were valued for millennia. Colored cottons were still considered special and valuable in the earlier 20th century, but gradually fell out of use due to the greater effort required to grow them and the higher prices that unfamiliar buyers were not conditioned to pay. However, recently interest in them as a vital part of the Maya aesthetic has led to a revival (see Contemporary Times below). Elsewhere, such as in Louisiana, they are also being revived; there the brown varietal is historically known as “slave cotton,” reflecting a lower value placed by Anglos on less-than-white cotton in the past (McFarling Williams 1994, 18). Obviously, culture and time period dictates how naturally colored cottons are valued. Figure 16. Not only white (c.), in the Americas cotton grows on the plant in several colors (light brown [a.] and greenish yellow [d.]). When boiled the light brown and the green darken noticeably (b. and e., respectively). Courtesy of Rebecca Stone and Paula Vester. Photo by Bruce M. White, 2011. Nevertheless, the darker cottons are special in various ways. They have a shorter staple (meaning each strand within the fluffy ball of cotton is a little shorter than in white cottons), making it impossible to employ machine spinning. This keeps them in the realm of handspinning and weaving, and only useable by the most skilled artists. In recent times, this keeps quantities low and prices high. Naturally colored cottons also have the advantage that they do not fade as dyed cotton does. Though the shades are originally, as mentioned, pale and subtle, they tend to get darker and physically stronger from washing. Thus, the natural dark cottons last longer and actually improve with age and use, setting them apart from white and dyed cottons which become stained and faded. Knowing this, one can see that brocading covers up large areas of the natural cotton represents an act of conspicuous consumption. However, textile-savvy viewers know it to be underneath the added patterning (Emery 1966, 173). This gesture may remind us of the Quechua concept of ukhu, the importance of what is hidden (see Dialogues in Thread). Likewise, to include both shades of the light brown in subtle stripes is the epitome of flaunting two of the unusual cottons. The lighter beige is known as ixaco. Figure 17. In the mid-20th century, as in this ca. 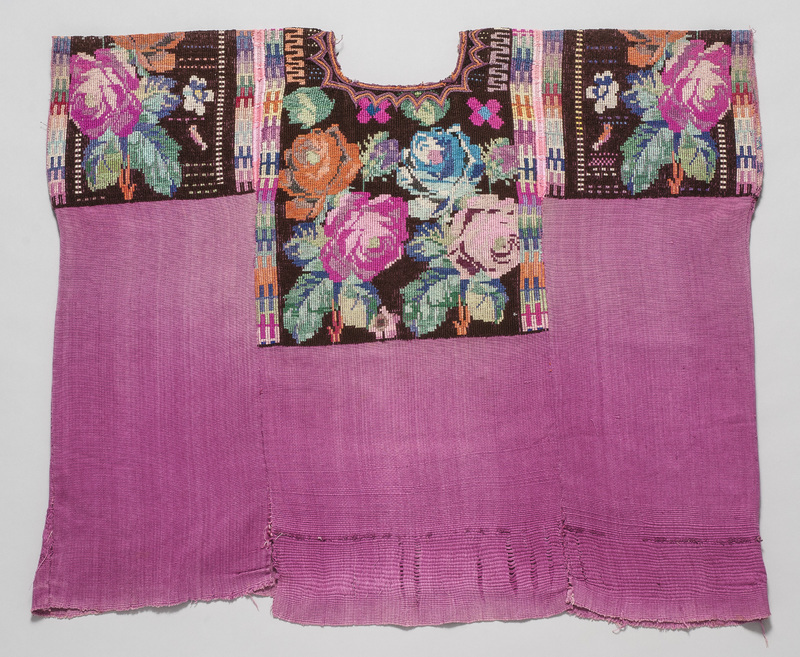 1945 example, the Chichicastenango blouse palette began to shift toward purple and pink, and away from red. However, this piece retains all four of the black cloth appliquéd circles that represent the moon and therefore indicate the fertile, mature, and more traditional status of the woman wearer. Michael C. Carlos Museum, 2009.42.105. Photo by Michael McKelvey, 2017. With four moons appliquéd on top of the brocade, the layers of status and meaning multiply. In the Carlos collection, only figures 1 (detail 15) and 17 retain all four of their moons, while figure 14 has two. In comparison to the usual product, even in the 1930s, “The pot made for sale to tourists are likely to be carelessly made as regards the symbolic decorations, for the details of these designs when correctly and completely made, require much time and patience, and the tourist as a rule does not know the better from the worse.” (Rodas et al. 1940, 124) Hence there may be none at all on some of the pieces (e.g. figs.17-20), especially in modern and contemporary times. It is also possible that huipíles sold after use had their moons removed since the symbolism would be lost on, and inappropriate to, non-Maya owners. In the 1940s new tendencies begin to creep into the Chichicastenango oeuvre. Though still mostly white in the backgrounds, the brocaded reds give over more and more to pink and purple (figures 17, 18 [ibid., 119]). In the past, purple had been scarce and difficult to achieve. However, using aniline dyes it is easily accomplished; indeed, these chemical dyes were developed in search of a purple that was favored by European royalty (Udale 2014, 65). Blue enters the picture in bits and pieces (fig. 18) as well, on its way to figuring more and more prominently in the succeeding decades. Flowers are also a new type of imagery that grows in importance beginning in the mid-20th century. Again, we might automatically look to European cloth — so often covered in flower imagery — for the inspiration here. Yet, why would it seem to take hundreds of years of colonization to “accept” this subject matter? Figure 18. Another pot from ca. 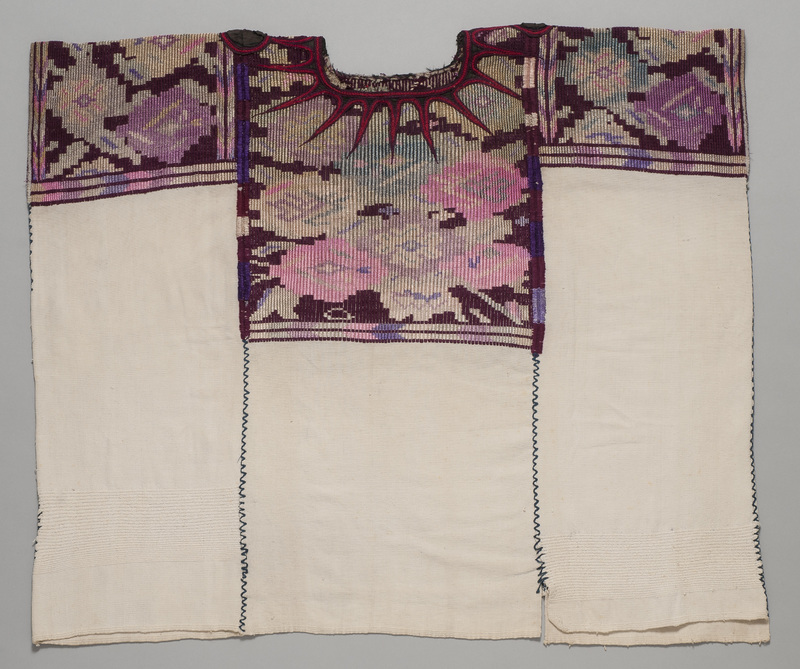 1945 displays the new floral patterning that has become synonymous with Chichicastenango textiles in later years. Michael C. Carlos Museum, 2009.42.117. Photo by Michael McKelvey, 2017. In indigenous Maya thought and practice, “like the gods, the ancestors appreciate the fragrance of rose petals and the smoke of incense and the beauty of candle flame…and [the ancestors] use their influence upon the gods [on behalf of the living]” (ibid., 63). The author reiterates, “flowers, kotsih, ‘prayer-containers,’ are sacred because their aroma is pleasing to the ancestors and, ascending, suggest prayers” (ibid., 126). To update our understanding, it is safe to say that flowers and other smell-producing items do not suggest but actually are believed to carry thoughts and wishes. Seeing objects as living vehicles for spirit is a strong theme in ancient and modern traditional indigenous thought (e.g., Stone 2016; Stone 1986). Whether considered true today or not, in the mid-20th century, flowers on belts were purposefully positioned above the womb and so symbolize the woman’s fecundity (Rodas et al. 1940, 126). Flowers seem to connect to the spiritual realm wherever they might be worn and spread over a high-status, three-part cofradía huipíl the motif is particularly visible and imporant. The shamanic practices and Catholic ones overlap in this arena: recall that flowers are always for sale on the steps of the Santo Tomás church (fig. 9), arguably the liminal zone between the worlds of shamanism and Catholicism. For many more instances of syncretism, see Dressing the Saints. Figure 19. Chichicastenango women’s dress around 1960 reflects the brilliant palette adopted throughout world fashion at that time. Michael C. Carlos Museum, 2009.42.382. Photo by Michael McKelvey, 2017. As the worlds continued to collide and globalism increased, from mid-century to today, Chichicastenango pots entered the worldwide color frenzy that began with 1960s fashion. One obvious change is that the white background of many huipíles was substituted with bright pink (fig. 19) and even purple by the 1980s (fig. 20). Yet the Maya love for color was already in place, from ancient times onward (see The Ties that Bind), so once again this is an example of embracing from outside what is already present in the indigenous worldview. The jump in color is perhaps the biggest leap and corresponds to time of widespread upheaval in the political, religious (at least Catholic), and social fabric in many places worldwide. The civil war in Guatemala began in 1960 and lasted until 1996, so obviously not only the United States and Europe experienced widespread unrest and conflict. Yet the intensity and scale of Guatemala’s war and how the Maya were tragically caught in the crossfire in many ways makes this situation more poignant (Little 2009). Interestingly, the 1960s and later neon-colored brocade and backgrounds made K’iche’ Maya women stand out even more than before, and during a time when proudly being indigenous had become a dangerous stance to take. This might be seen as another instance of K’iche’ cultural stability as well as their stubborn rebelliousness towards Anglos, continuing the attitudes of their 16th century predecessors. Indeed, to flaunt color and pattern of traditional dress was so risky that many indigenous people sadly forwent their native dress during the later 20th century in order to survive (José Antonio Gonzalez, personal communication, March 2016). Figure 20. In the 1980s the love of purple that began fifty years earlier becomes transposed to the background and new twisting patterns accompany the flowers that emerged thirty years before, resulting in a whole new look. Michael C. Carlos Museum, 2009.42.383. Photo by Michael McKelvey, 2017. Despite the obvious changes — such as the proportionately large flowers, the touches of blue, and the admitted slight decrease in overall quality — some aspects nevertheless persist. The telltale sun embroidery still encircles the neck of figure 19, though it is lost in figure 20, perhaps because in this later piece an innovative square neckline has been chosen as well. As time progresses, such new elements appear, such as the twisting strand on the purple huipíl. Yet zigzag mountains remain toward the edges of the brocade in the middle panel. 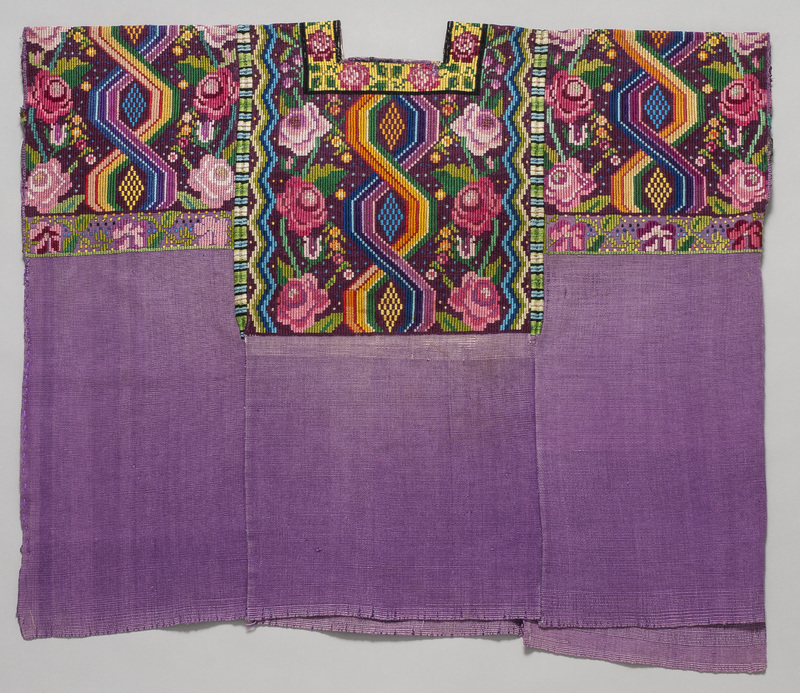 By the 1980s the flowers on Chichicastenango blouses became not only large, but far more illusionistically rendered, almost reminiscent of Euro-American needlepoint. Shades of pink alternate to suggest the complex arrangement of petals. The staid maroon geometric world of earlier blouses seems long gone. Moving forward towards the present, the early 2000s are represented by a striking recent acquisition to the collection (figure 21). Here on a black background, already faded to a deep charcoal grey, the neon palette pops as never before in the history of Chichicastenango pots. However, notice that the neck embroidery persists as the ongoing signature of the best and most characteristic products of this town. This may be attributed to contemporary tourists seeking the “authentic” Chichicastenango product, or simply to a particular artist’s predilection to pay homage to her ethnic group. In addition, the designs still have a few flowers, but they now only occupy the borders of the two side panels. The composition is once again dominated by the traditional, repeated, zigzag mountains and diamonds. The weaving and brocade are very high-quality, showing that later pieces are not necessarily poorly woven or finished. Such examples garner hundreds of dollars in the market today and even more when the middlemen have taken their share in stores and on the internet. Figure 21. 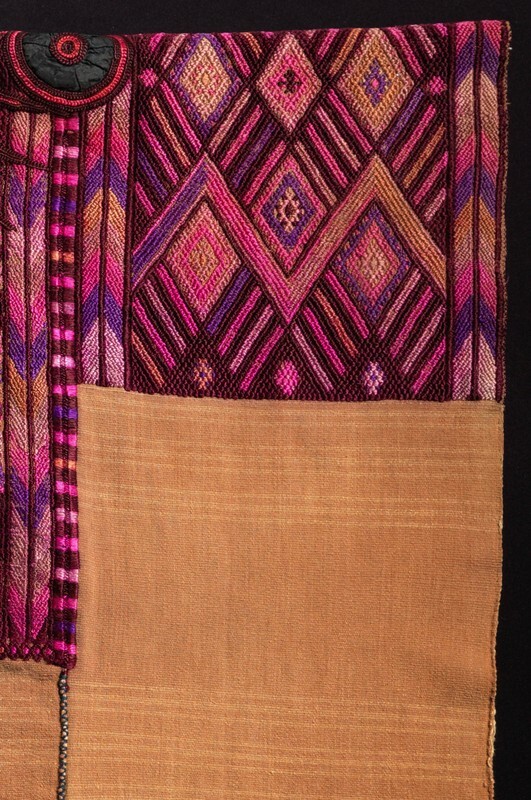 A contemporary Chichicastenango blouse, ca. 2010, keeps the neon palette of the late 20th century but returns to a more geometric design, such as the zigzag which represents the mountains. Michael C. Carlos Museum, 2016.18.1. Photo by Michael McKelvey, 2017. 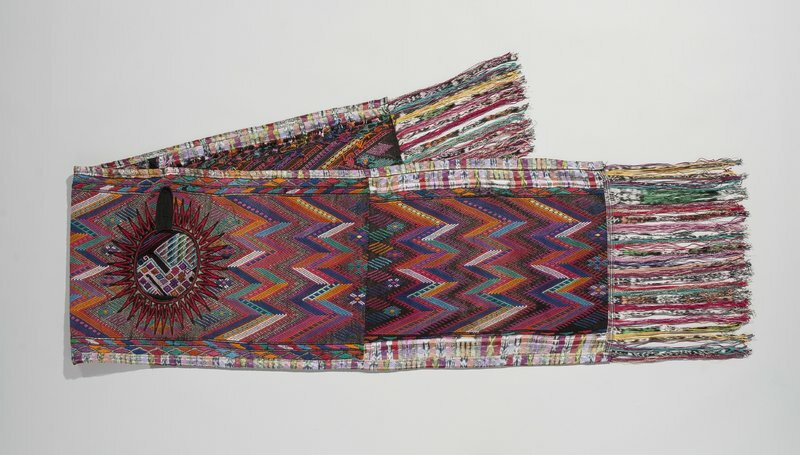 As a means of keeping their own hard-earned profits, a constant concern of indigenous artists today, since the 1970s numerous women’s textile collectives have sprung up all over contemporary Guatemala. Local current needs, such as their children experiencing Spanish-oriented education, now can be met by pursuing traditional textile arts, in a new twist on the issue of continuity and change. Some collectives such as ProTeje, literally meaning “for Weaving” but also with a key double meaning of “Protect,” were formed via the Museo Ixchel del Traje Indígena, the institution that has featured the Maya textile arts since 1993 (fig. 22). The museum’s mission is to collect, preserve, research, and display indigenous dress from all times and all parts of Guatemala. Its installations are colorful, informative, and beautiful. Abundant pride in Maya fiber accomplishments is evident. 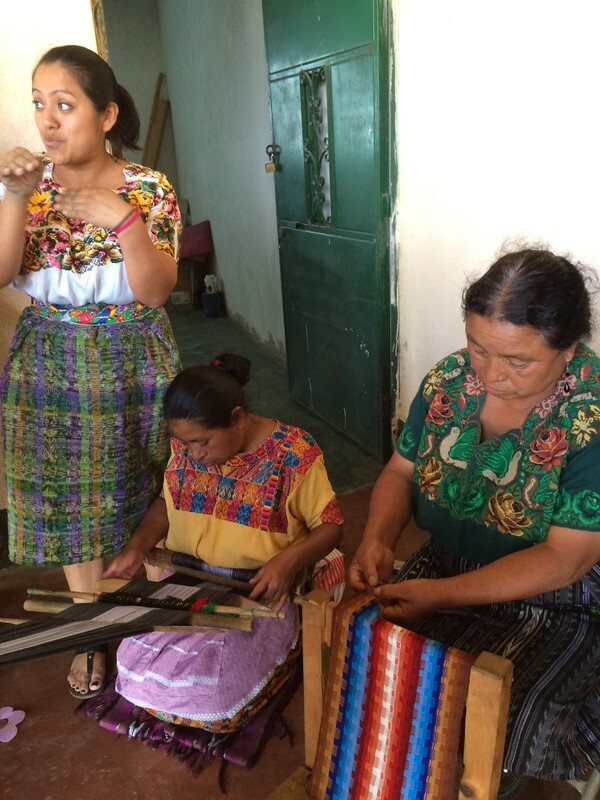 “Born from a desire to preserve the Guatemalan history of the backstrap weaving culture of indigenous women, five women volunteers of the Ixchel Museum of Indigenous Dress launched ProTeje (for the weavers) in 1994. Starting with only two women weavers, this project has grown immensely over twenty-three years, now supporting 300 weavers from nine departments and twenty-four communities. ….They started with cotton seeds from Horacio Villa Vicencio who owned a cotton plantation. Now deceased, his daughter Luisa keeps the project going, growing natural and brown cotton. ProTeje began using natural dyes in their weavings in 2012. Adapting symbols from traditional dress, with each community having its own design, guarantees originality and avoids duplication. The motifs are suggestive of the weaver’s life and history–slithering snakes and the twisting of vines; birds, animals, fruits and flowers; the seasons portrayed in the woven colors of the tree’s leaves. The Tree of Life is one example of elaborate symbolism, each one representing the importance of lush trees to the Maya and reflects the arduous work of the weavers” (Murphy 2016). Figure 22. 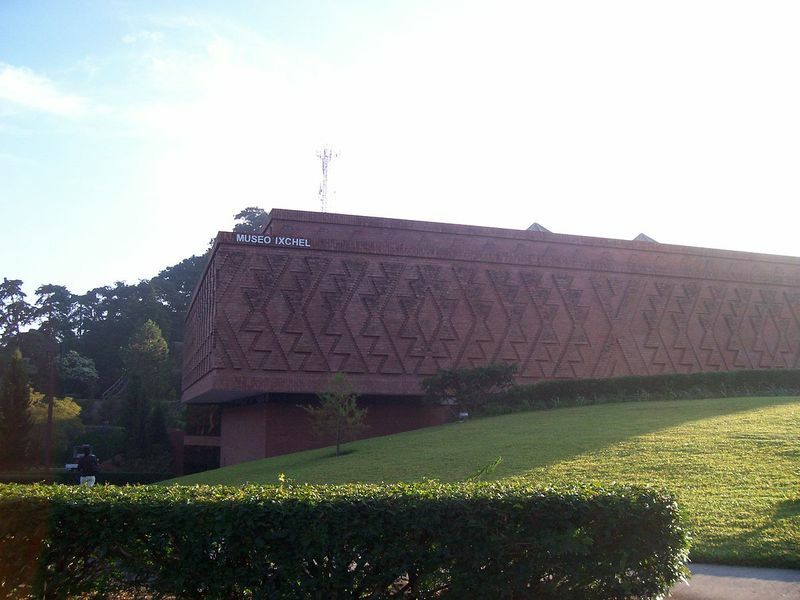 The exterior of the famous Museo Ixchel del Traje Indígena, named for the Red Goddess Ixchel and built with textile-inspired brickwork. Photograph by Clau.mrossal, licensced under Public Domain. Among the many other cooperatives, two near Lake Atitlán deserve mention: Orgánica in San Juan de la Laguna, run by Tz'utujil Maya women; and Corazón de Mujer in Chimaltenango, representing the Kakchikel Maya. “Doña Dominga, the 88-year-old matriarch…show[s] off some detail or other on a shawl or a purse, chatting all the while. ‘When I was younger, women only cooked,’ Dominga says. ‘Now they have freedom to weave and make finer work.’ She seems pleased to have given her daughters a semblance of stability and autonomy in a country where women are often marginalized. ‘I taught them the work that I do and now, gracias a Dios, they all have their own shops,’ she says, proudly. Another of Doña Dominga’s daughters, Socorro, has led her co-op of forty women since 1971. Called Botánica, it’s housed in a workshop space not far from her sisters’ stores. In addition to shopping the finished textiles, visitors can see the process behind the work. Large pots filled with dye sit atop a two-burner stove, and in the center of the room, huge baskets are filled with fluffy balls of cotton, most in shades of white and cream, and some a warm caramelly brown, from a different strain of the plant. Figure 23. Carlos Museum docent Mrs. 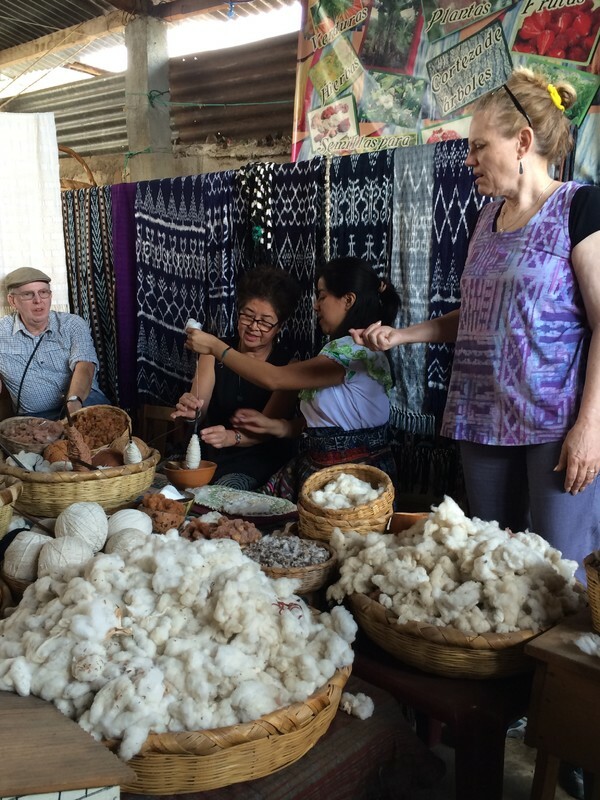 Tip Weniger learns to spin at the Orgánica cooperative in San Juan de la Laguna in 2016. Photograph by Robert Boas. ‘We use fruits, vegetables, herbs, plants,’ says Rosario Yac, a 26-year-old local woman who helps Socorro run the co-op. She walks me to a display in one corner of the workshop, where several baskets each contain balls of cotton thread dyed in shades of mauve and goldenrod and khaki, as well as a variety of leaves, seeds and roots. These are some of the sources of the natural dyes that Tzutujil women have used for generations. Indigo comes from the sacatinta plant, yellow from chipilín leaves, and ground-up palo de campeche makes bright blue. Elena learned to weave at the skirts of her mother, Doña Dominga, as did her six sisters, all of whom belong to co-ops. Because Elena and ten friends formally organized about five years ago, she says, they’ve been able to cut out the middleman and keep more of what they earn in sales. Before, a broker might have paid a weaver only 75 quetzales (about $10) for a purse that sold for more than twice as much. Now, that same purse, sold through the co-op for the same price, returns up to 90 percent of the proceeds to the woman who made it. The rest goes to overhead on the shop. ‘It makes a difference in the kids,’ says Noe Vasquez, Elena’s partner, who notes that before the co-ops formed, most families couldn’t afford to educate their children. ‘Now all the kids in San Juan go to school.’ (Washington Post 2015). Figure 24. Women from Chimaltenango, members of the cooperative Corazón de Mujer, demonstrate traditional weaving to interested tourists. Photograph by Robert Boas. The women at the Corazon de Mujer cooperative in Chimaltenango introduced themselves to the group I was with by giving their first names and proudly announcing how many children, of what sexes, they have birthed. This declaration of motherhood suggests a continuity with the appliquéd moon motifs on earlier huipíles that signified the wearer’s fecundity. Each woman got the chance to speak and welcome the outsiders, using the voices they had been denied in recent Guatemalan history. Staged like a cooking show with partially finished pieces at different phases, the women clearly explained complicated weaving processes with aplomb. Their wares waved gorgeous in the bright sunlight and breeze and my group shopped with abandon. Each group member was invited to an overnight stay in one of the women’s homes, sharing a delicious meal and being given the family’s only bed in many cases. It was the highlight of the tour for many of the participants, with cross-cultural appreciation of the fiber arts a unifying factor. These cooperatives, and the many others throughout Mayaland, show that textiles still lie at the center of Maya life, even as the world has tried to convert, enslave, and persecute them as well as appropriate their products for profit. Strong indigenous continuities have sustained them and their dress remains the most heartfelt expression of their identity.